Thank you to all of you who indicated an interest in the proposed showing of the film to marl the 75th anniversary of the Kreipe kidnap. We have explored a number of options, and looked at costs. To hire somewhere would have required more commitments than we received, and meant that we would have had to enter into contracts that required large deposits up front. The decision has therefore been made to withdraw the proposal. We shall keep you updated with any other events that are planned to make this anniversary. This entry was posted in Ill Met by Moonlight and tagged Ill Met by Moonlight on March 2, 2019 by proverbs6to10. View from the village of Kapetaniana, Asterousia. Thinking of going to wild and rugged Crete this year? It is the 75th anniversary of the Kreipe kidnap and there will be a lot going on. A nice little article here about one family and their efforts to create a unique holiday environment in Heraklion province. On the Orthodox Feast of the Holy Cross, every September 14, the faithful from villages near Mount Kofinas climb its peak to observe an ancient rite. On the summit, three small trees – a species of white-beam – bear fruit at this time of year. The fruit, which looks like cherry-sized apples, is gathered, soaked in water, and blessed, before the priest shares the tiny ‘apples’ with the worshippers. They eat them not only as a holy Eucharist, but for their believed healing properties. 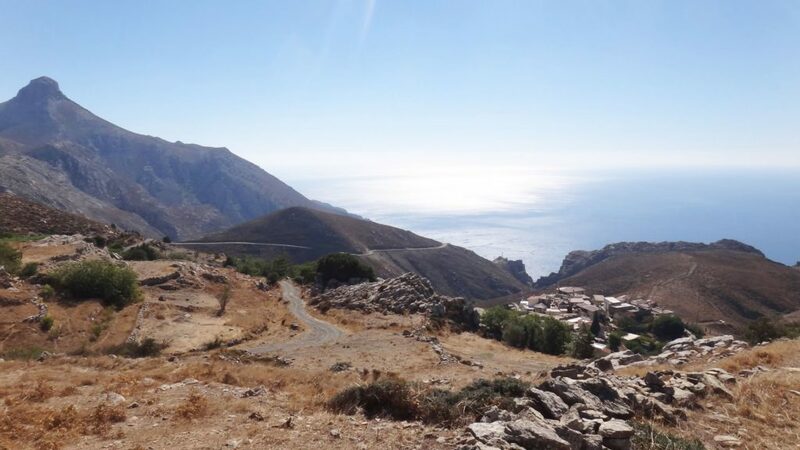 Predating Christianity, this ritual dates back more than three thousand years, for here at this Minoan peak sanctuary, one of more than twenty across Crete, the echoes of deep history are carried in the wind. What attracted the Minoans to settle at this sacred place is what brought the founder of Thalori Retreat – Marcos Skordalakis here: a spiritual energy which weaves its way through the peaks and passes, before sweeping down to the beaches that lie a dizzying thousand metres below. The village of Kapetaniana, perched high on the western approach to Kofinas, is where Marcos began building (or rather rebuilding) Thalori in 2001. For six years the former restaurateur set about transforming a dozen ruined houses into some of the finest holiday accommodation available in Heraklion province. Combining rustic authenticity with contemporary comfort, Thalori opened in 2007 and today comprises 20 houses, a restaurant, and a working farm with riding stables. This entry was posted in Uncategorized and tagged Crete, Greece, Ill Met by Moonlight, Major General Heinrich Kreipe on January 14, 2019 by proverbs6to10. If you are sorting out your diary for next week and happen to be in London on Wednesday, a good way to spend the evening may be to come along to Waterstones Piccadilly to this special event. Our good friend, ex-Coldstream Guards officer, sometime Pilgrim, and author of In the Dolphin’s Wake and Like a Tramp, Like a Pilgrim, Harry Bucknall has been busy over the summer arranging a very special event be held at Waterstones Piccadilly on Wednesday 26th October at 7pm. The Cretan Legacy, a panel discussion, will examine the SOE abduction of General Heinrich Kreipe carried out by Paddy Leigh Fermor, Billy Moss and men of the Greek Andantes on Crete in 1943. The panel, chaired by former Irish Guards Officer and SAS Squadron Commander, James Lowther-Pinkerton, will include Alan Ogden, SOE expert and author of Sons of Odysseus; Chris White, contributing author to Abducting a General; Rick Stroud, author of Kidnap in Crete and Dr Klaus Schmider, military historian, senior lecturer at the Dept of War Studies, RMA Sandhurst and Wehrmacht expert. With audience questions, the panel will discuss whether “this Hussar Stunt” – as Kreipe referred to his capture – was worth the undertaking in both the short and long term and assess its achievement, legacy and place in the annals of military history, endeavour and folklore. No doubt there will be wine and a chance to chat to friends old and new so do come along if you can to Waterstones Piccadilly on Wednesday 26th October at 7pm. All you have to do is reserve a £5 ticket in store or by emailing Piccadilly@waterstones.com. I think just turning up on the night will be just fine too. This entry was posted in Abducting a General, Events, Ill Met by Moonlight and tagged Abducting a General, Chris White, Harry Bucknall, Ill Met by Moonlight on October 22, 2016 by proverbs6to10.